The Korean culture has spread worldwide from the emergence of K-Pop and Koreanovelas. With my bros as my TV buddies, I still watch those addicting Koreanovelas every now and then. We also got to admit that we've listened, sang and dance along with the trendy hip Korean pop tunes. Because of these, we wanted to experience what it was like to be physically present in the country that we just see and hear. With our Korean Visas in hand, we landed in Incheon Airport with the pilot saying: "...the temperature outside is 1 degree below zero and there is a light snow...." We were going to see Korea at the tail end of fall and start of winter. 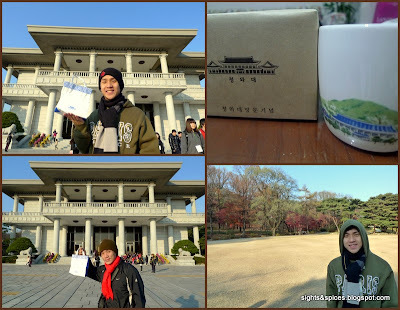 As soon as we left our things in our room, we went straight to Gyeongbogkung Palace. 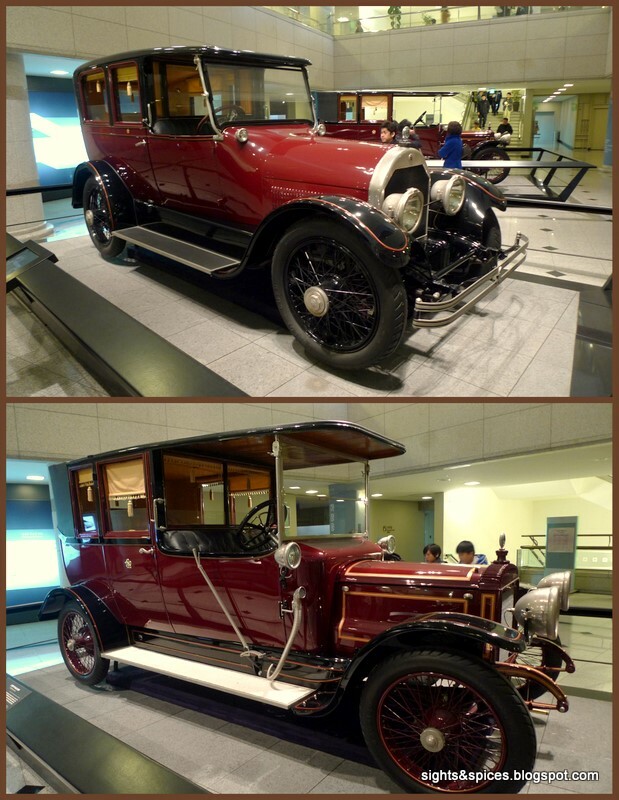 It is the largest palace that can be found in Seoul, the grounds were so spacious and the details on restoring how the palace looked like before was astonishing. Outside, we got to watch the changing of the guards ceremony. Just beside the palace was the National Palace Museum. 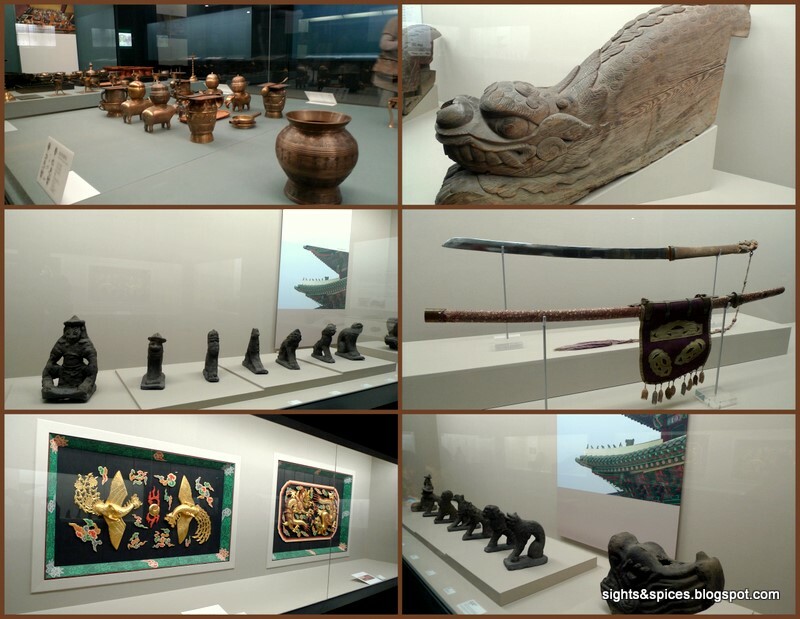 Inside were different Korean artifacts from the past. We made our way to the exit and waited at a booth that would served as the pick up point for the Cheong Wa Dae Tour. Cheong Wa Dae or Blue House is the official office and residence of the President of Korea. It is known as such because of the blue tiled roof that covered the grand and majestic palace like structure. We started the tour by watching a video and continued the tour on foot. Taking pictures were not allowed in most areas. We were given free mug each as a souvenir for the tour. 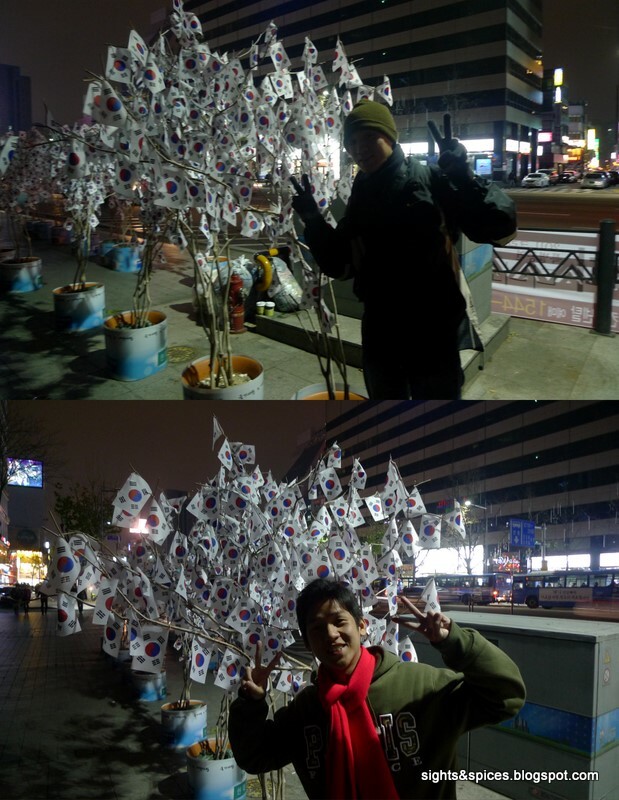 We made our way to Gwanghamun Square as the temperature drops further more. 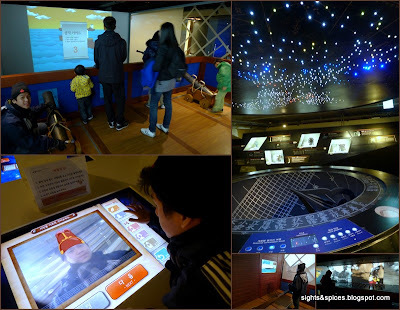 We were in dire need of warmth that we accidentally discovered The Story of King Sejong and Admiral Yi Exhibition Halls which was literally under the square. Inside were different interactive audio video displays as well as replicas of statues, weapons and artifacts from King Sejong and Admiral Yi's time. We were impressed on how modern and fascinating the displays were. And the best thing about it, the entrance was for free. On our first night, we decided to head for one of Seoul's famous shopping district, Myeongdong. Myeongdong was so alive, different shops and street stalls light up the street as crowds of locals and tourists were strolling around. This place would be a haven for fashionistas as there were big western brand boutiques as well as 'tiangge' type stalls to shop from. There were different animal cartoon characters in full costume inviting people and their pets to go to their pet grooming salons. Luckily for us, we made it to Nanta's last show for that day. Nanta is a comedy 'cooking' musical where they used different kitchen utensils as musical instruments to come up with rhythmic beats. It started during the late 90's and still is on-going. The show was really entertaining but I would suggest to those who plan to watch not to expect it to be Stomp-like. 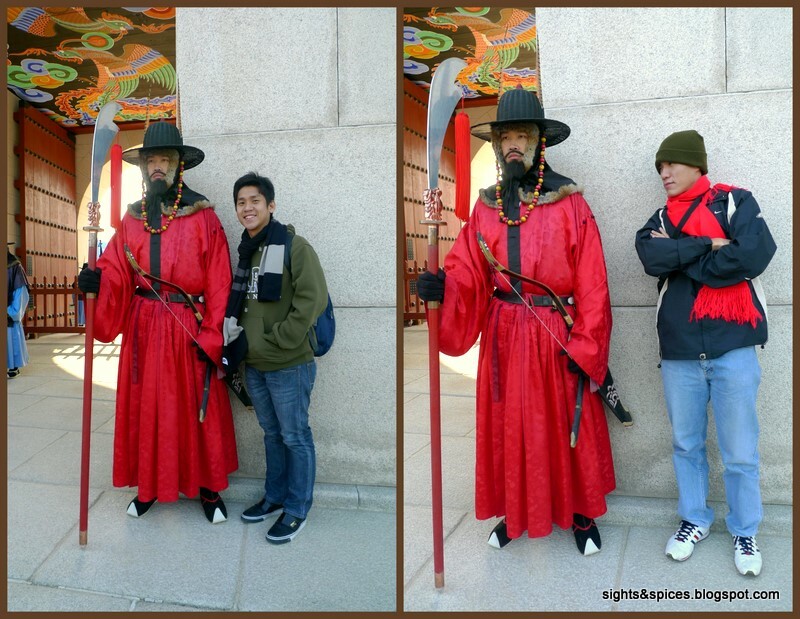 The next day we headed to look at another palace, The Changdeokgung Palace. The palace and gazebos looked like the ones we saw in Gyeongbukgong. After going around, we lined up at the entrance to join the English guided tour at the Huwon Garden or Secret Garden. The garden was huge, it was more like a mini-forest. There were huge trees, a lotus pond, lawns and numerous pavilions. During spring different species of flowers can be found but at the time of our visit the leaves have fallen, everything looked brown and bare. Best visited during Spring where flowers are in full bloom or during Winter where the whole place looks white and sparkling. We saw this unique looking tree on our way out. It seemed to be growing horizontally. That night, we visited another shopping district, among all the shopping districts that we went to in Seoul, our favorite was Insadong. An area which is known for souvenirs, antique galleries, tea stores and shops, traditional arts and crafts and everything local. The place radiated a local culture vibe which we likened so much. While walking, we saw this candy vendor clanking his cleavers while singing. We didn't understand what he was singing about but we assume that he was calling out people to buy his candy. Do stop by at one of the numerous Kultarae Stall and watch how they make honey candies.You can ask for free samples too. Towards the end of the street, we tried out hitting balls in the batting cages. One thing we noticed around the shopping areas are the numerous pictures, posters, standees and souvenirs of Korean artist and pop stars. The next morning we were supposed go hiking in one of Korea's numerous mountain tops. 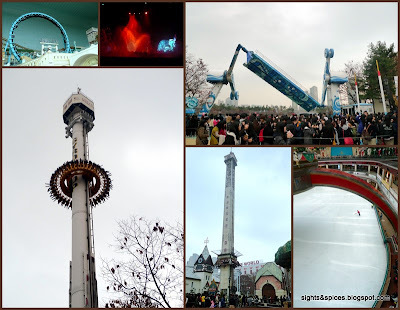 It is said that it's considered one of the favorite past time of Koreans but with temperatures dropping below zero again, we decided to slash it off our itinerary. We just headed for the N Seoul Tower in Mount Namsan. We chose the best way to get to the tower and that was by Cable car. Upon reaching the top, we walked around the area. There was a flock of pigeons around, we had a blast feeding them with crumbled crackers. There were 'couple padlocks' that were shaped into Christmas Trees. The padlocks are one of the reasons why couples go to Mt. Namsan, couples would locked the 'couple padlocks' to each other to symbolize that they are forever locked to each other. 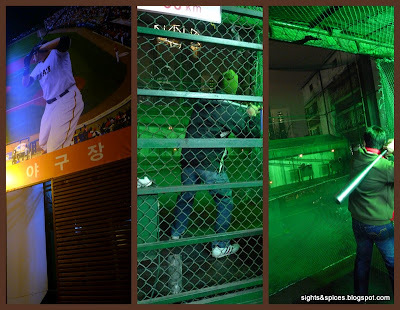 While waiting for the elevator to take us up the observation deck, the whole wall was projected with pictures of the view of Korea at night. 'While waiting for the elevator..."
The weather was kind of cloudy and hazy that morning, we didn't get to see much of the views around. Be sure to drop by the sky restroom, the restroom also gives a nice view. 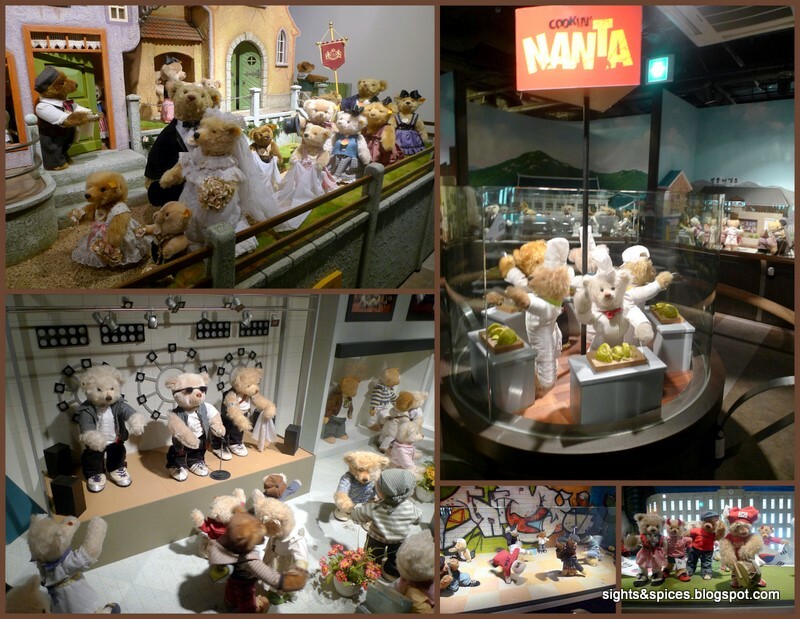 After getting down from the observation deck, we made our way to the Teddy Bear Museum. The museum shows the history of Korea from past to present using cute and adorable teddy bears. We were pleasantly surprised to find out that the bears actually moves. It also showcased antique Steiff Teddy Bears, these teddy bears were made during the early 1900s and from what I know these cute little things can cost as much US $1000 or even more. 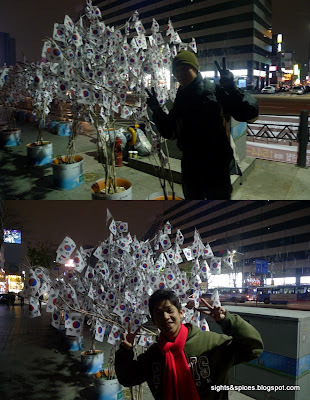 We headed to Hongdae, an area which is known as an university area. It is also known for the local indie music culture and the numerous clubs. But we were not there to go clubbing but rather visit a coffee shop that was used before to shoot one of the first few koreanovelas that got us hooked, The 1st Shop of Coffee Prince. As soon as we entered the gates, a barista came out and told us to order first before taking pictures. 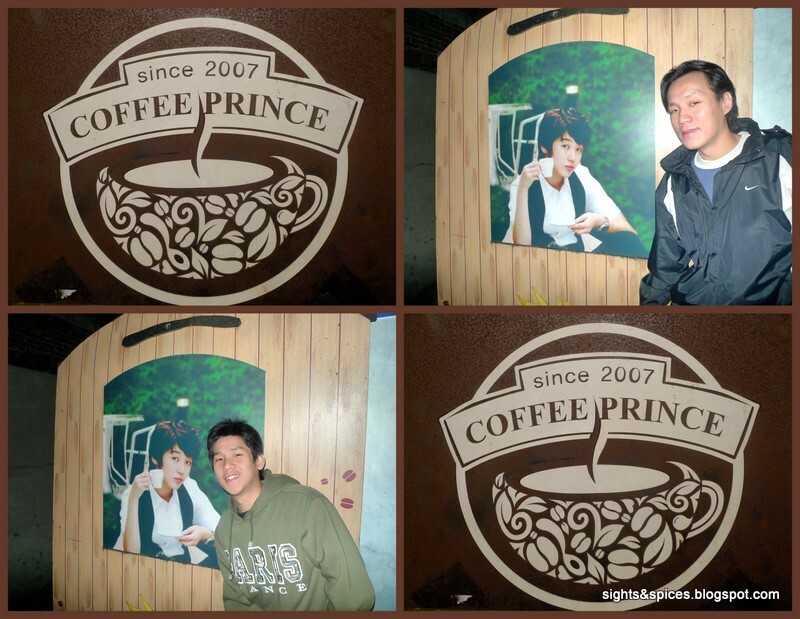 It was an actual coffee shop that was used to shoot the series. We walked around the Hongdae area and the people around were mostly the youths, it exuded a very lively vibe to which we really enjoyed. Along one street, there were buskers who were students playing the guitar and singing different Korean and English songs. We came across these two performers who we end up watching song after song. They were just awesome and from all the buskers around, they were the most watched. Every night before going home, we would unwind at Bong Bar. We would chat with the locals and tourists and shoot some pool as we chugged down our free beer. We got a free bottle every night because we chose to stay at Bong House. Bong House was located near a university, the street was alive til the wee hours of the morning. 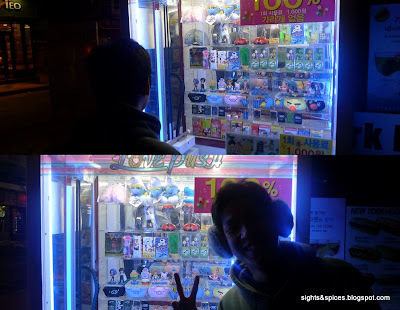 The street was filled with Arcade Machine Shops and Win a Prize Vendo Machines. "Look at What I WON...Earmuffs!!!" The next day, we made our way to Bonguensa Temple. A Buddhist temple where people can actually spend a whole day or go overnight to have a feel of the temple life for a fee. Though Koreans are predominantly protestants, a lot of locals would come here to seek peace and quiet time. What surprise us was the temple is situated with what we think is a busy business district in Korea. People were walking around in their suits and business dresses with cups of coffee in hand. While heading towards the temple, we saw very interesting looking buildings and structures. The temple was spacious with lots of trees that surround the area. It was indeed calming and peaceful. After visiting the temple, we headed to Korea's indoor theme park, Lotte World. There were different rides inside and outside, the outdoor area offered the bigger adult rides. 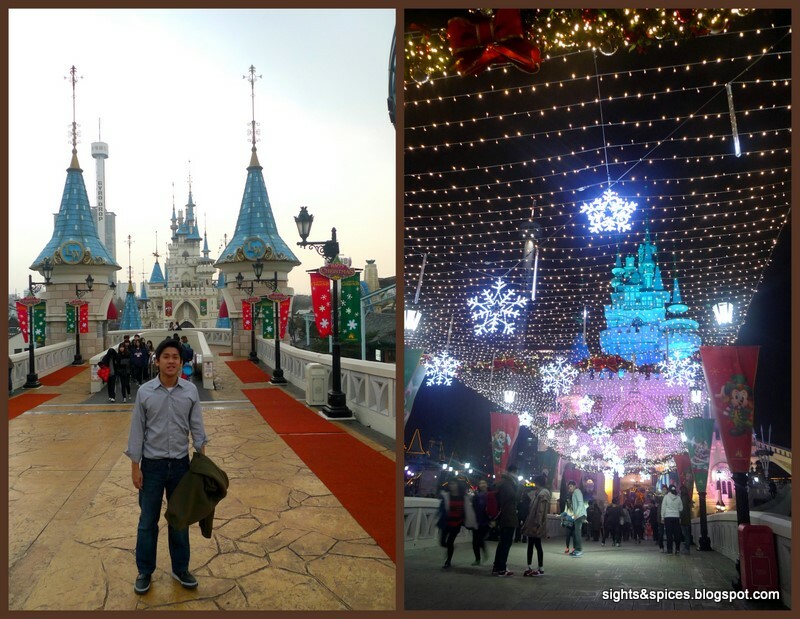 We were shocked to find long lines on the different rides, it was a weekday afternoon but still local students in uniform flocked the theme park. To get away from the crowd, we went inside the Folk Museum. 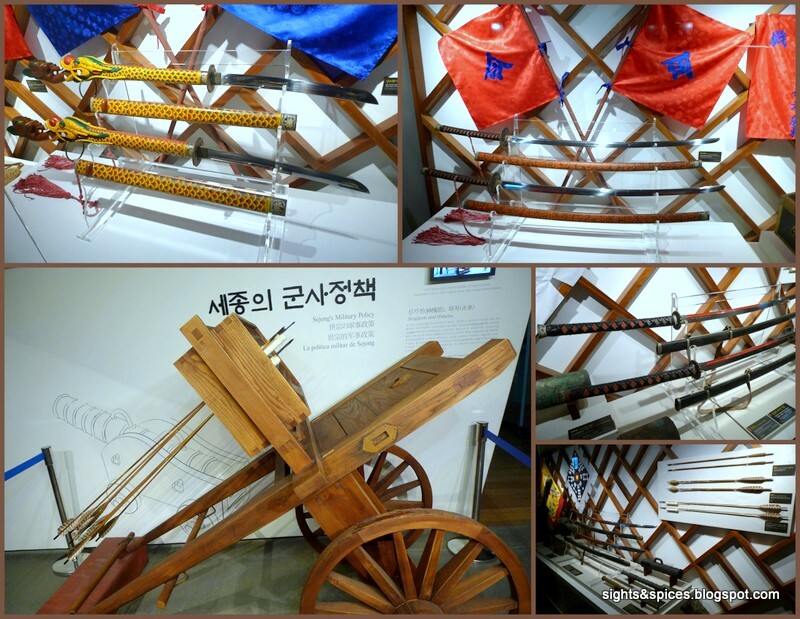 It tells the story about the history and traditions of Korea. 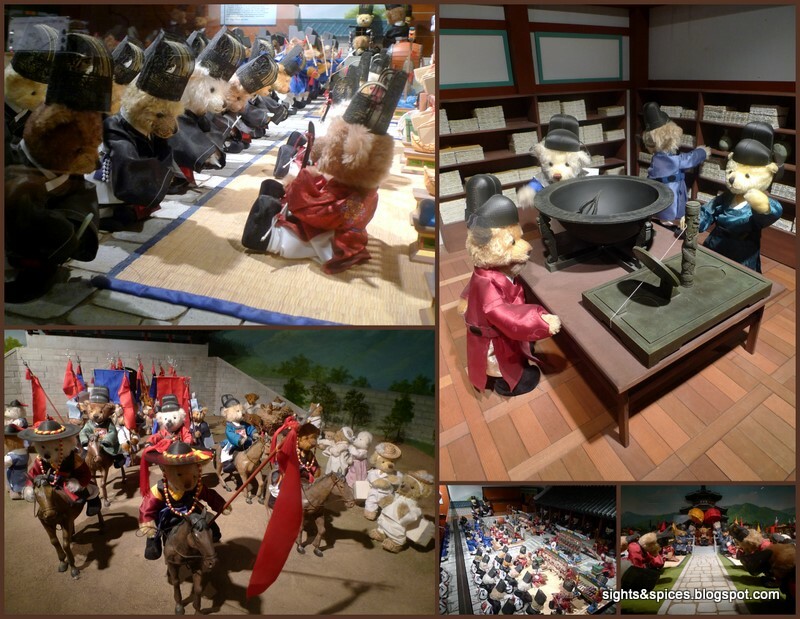 We enjoyed looking at the figurines and miniature model of the palaces, it made us appreciate the real thing more. After a tiring day from walking around, we headed to a Jimjilbang. 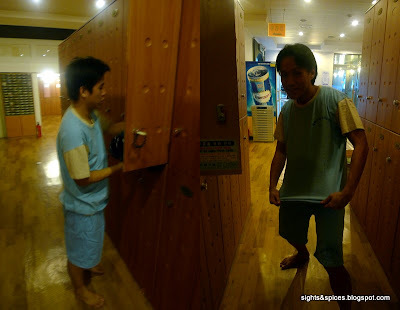 It is basically a public bathhouse with tubs and saunas of varying temperatures. Most Jimjilbangs would have a unisex area where there are TVs, computers, snack bar, massage chairs and sleeping mats. Locals love to come here to clean up and relax. Also male clients would come after having a drinking session and needs to have a place to sleep and spend the night at. As soon as we entered, we were given a key and a set of shorts and shirt. We didn't have any clue what to do first, luckily a client came out the shower area and instructed us on what to do. We took a shower and took a dip on the tubs. There were three hot tubs, two that were nice and warm and another which was freezing cold. There were also sauna rooms which has different temperatures. Important note: Before entering the shower/tub/sauna area, you have to go full monty! 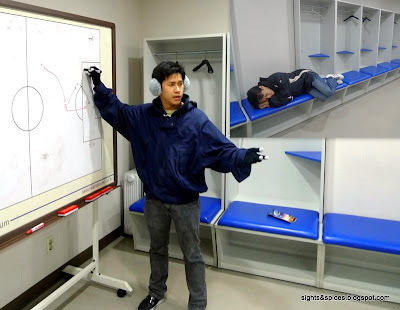 We put on our 'uniform' and went up to the unisex area to lounge around and have a massage on the massage chairs. After the experience, we really felt relaxed and refreshed. The next day we were so glad that we went to a place that wasn't part of our itinerary. After lunch at Noryangjin Market, we headed to the World Cup Stadium. 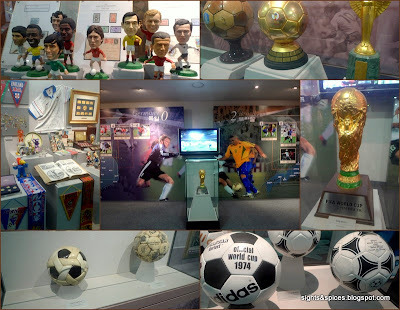 There was a train station named after the stadium and the train stop was filled with world cup pictures. The stadium was built into a shaped of a traditional Korean Kite. We had no idea on what to expect about the place, while walking around the stadium we were elated to find out that we can actually go inside. There were different world cup memorabilia that we saw. Even though there were only two of us at that time, the staff invited us to watch Korea's National Football Team's story during the 2002 World Cup. The best surprise about the World Cup Stadium was people can actually go inside the locker rooms, crowd area and the field itself. It was such a blast! 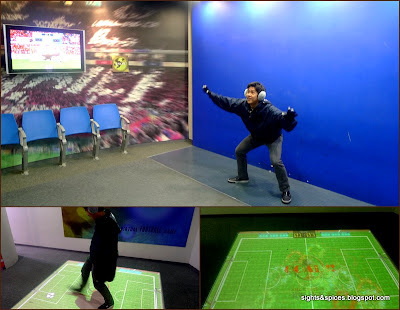 There were also interactive fun games. hey Jay, awesome pics buddy! definitely a must visit Hazel! hi rye! I'im quite sure you'll also like it here. If you need to know more details, I'l be glad to help you out. Thanks! Wow this helps a lot to lessen my research.. we're bout to go there this coming November. 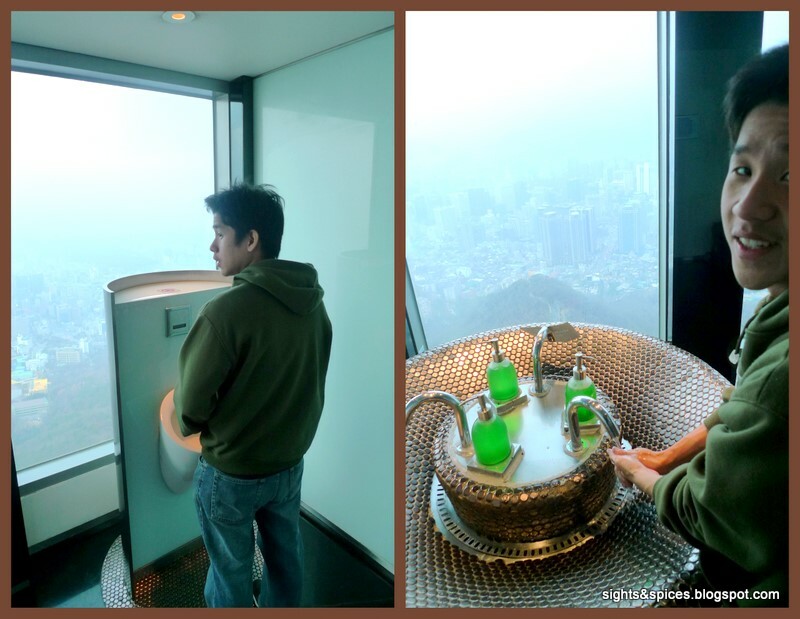 where did you stay in Seoul? What month did you actually went there? hi there! we were there on the last few days of november to the first few days of december, it was really cold! Feel free to email me(yajscheng@gmail.com) and i'll gladly help you and give you more suggestions. thanks! hi rose! thanks! enjoy your trip to seoul! i'm pretty sure you'll like it there. hope i'll also be able to go to busan on my next korea trip. thanks :) i really had fun during my trip kaya lang bitin hehe i'm actually planning to go back there. 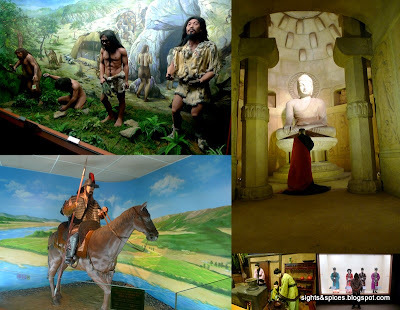 busan is more laid back than seoul :) visit it on your next trip to south korea.